Catherine (Cathy) Freeman was born in Mackay in Queensland. She won her first gold medal at a school athletics championship when she was eight years old. Cathy Freeman's stepfather, Bruce Barber, coached her until 1989. Cathy Freeman's family was poor and, like many Australian Aboriginals, suffered discrimination from white Australians. Once, after winning many races at a primary school competition, Cathy, who wasn't given a trophy, had to watch as the white girls she had beaten received trophies. Cathy Freeman won the 200 metres and the 400 metres at the 1994 Commonwealth Games in Canada. 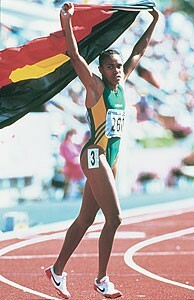 After her first win, Cathy ran a lap of honour carrying the Aboriginal flag and the Australian flag. The chief of the Australian team criticised her, and said she must not do it again. After her second win, Cathy defiantly carried both flags around the track. The Australian public loved it, with three out of four agreeing with her action. Cathy's main rival at the Atlanta Olympics was Marie-Jose Perec of France. In an exciting race in which Freeman led for much of the distance, Perec closed the gap and passed Cathy in the last 80 metres. Cathy Freeman's time of 48.63 seconds was a personal best and she won a silver medal.